Some students can take a while to find just what it is they would like to do with their lives and know what it is they want to study. Others fall in love with a career path from a very early age. BEng (Hons) Civil Engineering student Lloyd Clough certainly considers himself to be in the latter group. 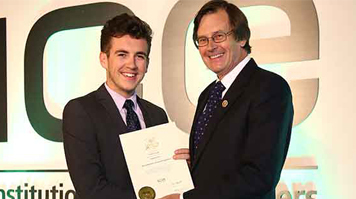 As Lloyd began to develop his qualifications he realised that professional accreditation was key in his career – this is where his involvement with the Institution of Civil Engineers (ICE) began. With a suitable record of continual development and a mix of projects under his belt with Morrish, including exciting events through LSBU from ‘TeamBuild’ weekend through to a Harbin University exchange trip to China, he has recently been admitted as an Engineering Technician to the Institution of Civil Engineers. Lecturers have industry backgrounds so they relate what we cover in lectures to real-world situations all the time. It’s also great that I am studying alongside part-time students from a wide range of roles in the Civil and Structural Engineering industry, and it’s interesting to hear what projects they have been working on. It’s something that the young boy excitedly poring over technical drawings with his stepfather would certainly approve of. Read more about studying BEng (Hons) Civil Engineering at LSBU.